A consortium of 10 Central Universities of Haryana, Jammu, Jharkhand, Karnataka, Kashmir, Kerala, Punjab, Rajasthan, South Bihar and Tamil Nadu (called Participating Universities, PUs) which were established by an Act of Parliament in the year 2009 and Bengaluru Dr. B.R. Ambedkar School of Economics having joined the consortium will organize a combined CENTRAL UNIVERSITIES COMMON ENTRANCE TEST (CUCET-2017) for admissions to their various programmes. The test will be conducted at different centres across the country on 17th & 181h May 2017. The Coordinating University invites aspiring students to apply for admission to various Courses and Programmes in above PUs( participating Central Universities). The Central Universities Common Entrance Test-2017 (CUCET 2017) online registration process concluded on April 19. All the candidates completed the registration process on the official website cucet2017.co.in. CUCET 2017 is conducted jointly by the 10 central universities which are: Central University of Haryana, Central University of Jammu, Central University of Jharkhand, Central University of Kashmir, Central University of Karnataka, Central University of Kerala, Central University of Punjab, Central University of Rajasthan, Central University of South Bihar and Central University of Tamil Nadu, under the guidance of Central University of Rajasthan. The examination will be held from May 17 to 18 at various test centres across the nation. Central University of Rajasthan has announced that the admit cards for the Central Universities Common Entrance Test (CUCET) 2017 will be released today(May 5). Candidates who have applied for the exam can download the hall tickets from the official website of CUCET upon release. The exams will be held on May 17 and 18, 2017, clearing which candidates will be eligible for admission to 10 central universities including Central University of Haryana, Central University of Jharkhand, Central University of Jammu, Central University of Karnataka, Central University of Kashmir, Central University of Kerala, Central University of Punjab, Central University of Rajasthan, Central University of South Bihar and Central University of Tamil Nadu. Candidates can expect the results for the exam to be declared by June 7, according to the official website. The list of courses offered and the minimum qualifications required for each course are available on the site. ~ Go to the official website for CUCET 2017 (cucet2017.co.in). 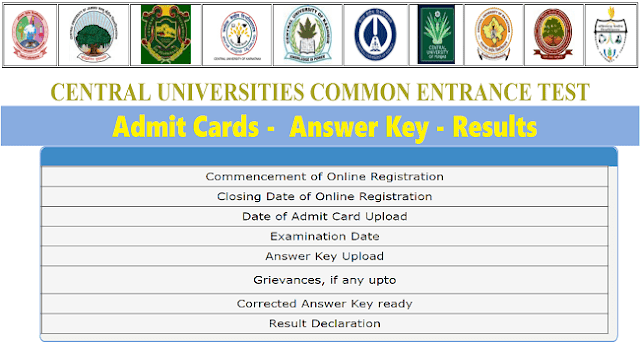 ~ Follow the link/notification available on the main page for the admit cards. ~ Fill in your details in the fields provided and click on “Submit”. ~ Download the admit cards and take a print out of the same for further reference. About the exam: The exam is held for admission to various undergraduate/integrated programme/B.Voc., post graduate programme and the research programme in ten central universities. check and raise your objections on https://www.cucet2017.co.in: The Central University of Rajasthan released the answer keys for the Central Universities Common Entrance Test (CUCET), which was held on May 17 and 18, on Friday. Candidates who appeared for the exam can check the answer keys by clicking here. Key in your application ID, password or date of birth in dd/mm/yyyy format, verification code (as in the image) and click on log in. The answer keys will be displayed on the screen. *Enter your verification code (as in the image) and click on log in. *The answer keys will be displayed on the screen. Candidates can challenge the answer keys in online mode only until 5pm on May 22 on the grievance portal in the format given below. The grievances will be evaluated by a committee of expert(s) and the decision of the expert(s) will be final. The corrected answer key will be released on May 29 and the results of the exam are expected on June 7. CUCET-2017 exam is conducted jointly by the 10 central universities - Central University of Haryana, Central University of Jammu, Central University of Jharkhand, Central University of Kashmir, Central University of Karnataka, Central University of Kerala, Central University of Punjab, Central University of Rajasthan, Central University of South Bihar and Central University of Tamil Nadu, under the guidance of Central University of Rajasthan. The test is conducted for the students of Class 12, bachelor’s and master’s degree holder for admission into the UG/integrated program/BVoc, postgraduate programme and the research programme respectively in these 10 universities. Answer keys has been uploaded. Candidates can submit the grievances from 19-05-2017 to 22-05-2017 (5:00 pm) through online only at grievance portal.